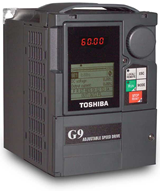 The G9 adjustable speed drive is the most advanced severe duty drive ever offered by Toshiba. It is a blend of a robust power platform and a state-of-the-art control scheme. With its 115 continuous overload rating and its dual 32-bit processor controls, the G9 provides the ability to operate the toughest of applications while still maintaining a high level of control.